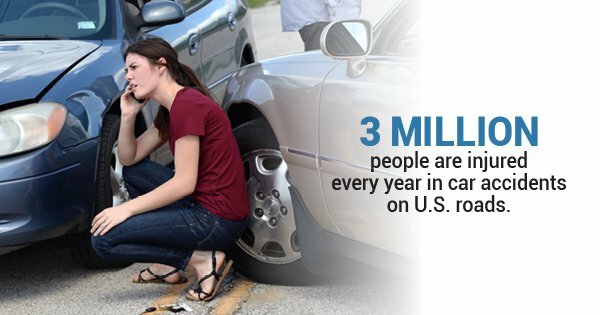 Every year approximately 3 million people are injured in car accidents in the United States. Hundreds of thousands of these injuries are caused by distracted driving. Distractions can come in many forms, but all of them involve the driver taking their eyes off of the road and focusing at least part of their attention on something else. By knowing these common distractions that cause accidents you can make efforts to focus your attention on driving instead. Passengers: While it may seem like another person in the car would keep you accountable for good driving, too often additional passengers create distractions for the driver. The driver may divert their attention from the road to their companion talking too often, or get involved in telling the other person a long story. Children and pets create especially dangerous distractions, as the driver might feel the need to take care of them while they are driving. Electronic Devices: At this point in our technologically-enhanced world, most people know that cell phones are a major culprit of distracted driving. Car accident lawyers handle countless cases for car accident victims who have been injured because a driver was texting or calling someone on their phone. Tablets are also a distraction to drivers, as they can make similar notification sounds as phones that tend to divert a driver's attention. Controls In Vehicle: Although adjusting the radio station or the temperature in your car seems like a perfectly safe and natural thing to do, even taking your eyes off of the road for just a second to do it can be very dangerous. Accidents can happen at any moment and if you're focusing on the volume controls you won't be able to avoid dangers on the road. Personal Grooming: Many people use their commute to work as a time to finish up their grooming routine. Whether it is applying lipstick, putting on deodorant, or brushing their hair, these small tasks can turn into big distractions. GPS: These navigation devices have become second-nature for many drivers to use, but a GPS can be a serious distraction. Setting up directions on a GPS while you're driving is never a good idea, as it takes away your attention just as texting on a phone would. Even glancing at it to read directions can result in an auto injury and a call to a car accident lawyer. Driving is a serious responsibility and drivers need to pay attention to the road at all times. When you get into a distracted driving accident, not only will you have to get car accident lawyers involved, but you run the risk of seriously injuring yourself and others.